I know it's been a while but here I am now! I started working and my commute is an hour and a half in the country so I don't get much time. But the good news is that I'm working with food all day long, and primarily with pulses (beans, lentils and peas!). We took a short trip to Vienna where I enjoyed idli sambar, which I know is really absurd but the fact of the matter is that you can't find that in Stockholm so it's just something I have to eat whether in London, Vienna, New Jersey or India! Idli is a fermented rice and lentil steamed cake that is enjoyed with a spicy lentil soup called sambar from South India. Growing up in Bombay, it's something I have eaten all my life. The idli wallah (guy) still stands in the same place selling idli and dosa (fermented rice and lentil crepes) and the aroma of the acidic, fermented batter always makes my mouth water whenever I pass him by. 1. The fermentation process makes the lentils and rice's protein, vitamins and minerals more available, therefore more absorbable to the body. It also makes it more digestible because it gets rid of the anti-nutrients like oligosaccharides that cause gas. This means it's much easier for those people that have sensitive stomachs. Even my grandfather can eat them without trouble. 2. Each component has pulses in it, which means protein and iron, among other things! 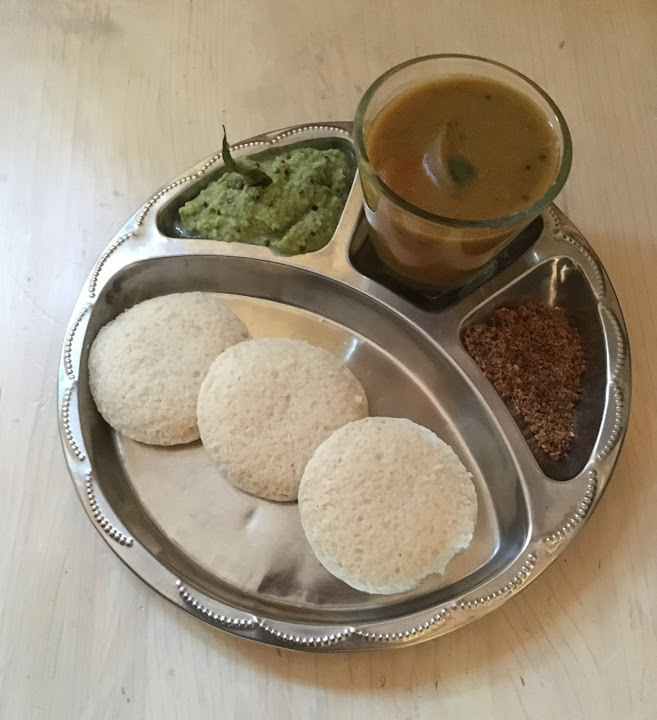 The idli is fermented with rice and urad lentils. The chutney is made with roasted chickpeas and the sambar is made with toor lentils. If you also find moolgapoodi then you have the addition of roasted urad lentils and split yellow peas. 3. It's satiating, satisfying and full of tropical flavors. It's a meal that I could eat for breakfast, lunch or dinner. So enjoy! And happy spring! 1. Rinse the rice and lentils separately really well, then soak separately for 6-8 hours. Soak the fenugreek seeds in a small bowl for 6-8 hours as well. 3. Rinse the rice and blend with 1 cup water. The rice doesn't have to be as smoothly blended as the urad lentils. Pour on top of the urad mixture and mix. The consistency should be fairly thick like cake batter. Cover with a tea towel and place in a warm place (or an oven with a pilot light on) for 8-20 hours. You want to see bubbles on top as well as when you stir the mixture -- it should be alive when properly fermented and depending on your climate, the fermentation time can vary. 4. Once fermented, add salt. Pour 1 1/2 - 2 tablespoons into greased idli molds (or you could use bowls or mini cake pans as molds too) and steam for 10 minutes. Then after 5 minutes of allowing it to cool, spoon out and eat immediately. 1. Rinse the soaked lentils and boil with turmeric and water until tender. Using a hand blender, blend until smooth. 2. Tarka: in a separate pan, heat the oil and add the mustard seeds and curry leaves. Cover on low and allow the seeds to pop. Once they pop for 10-15 seconds, turn off the heat and add to the lentil mixture along with sambar powder, sugar, onions, carrots, koukum flowers and its soaking liquid and boil for 10 minutes. In the last 5 minutes, add the zucchini. Taste for salt. 1. Blend all the ingredients for the chutney together. Taste for salt and if it needs extra lime. 2. Tarka: in a separate pan, heat the oil and add the mustard seeds, sesame seeds and curry leaves . Cover on low and allow the seeds to pop. Once they pop for 10-15 seconds, turn off the heat and mix into the chutney. SERVE a bowlful of sambar with 2-3 idlis and a dollop of coconut chutney on top. - Fermentation can be tricky and this batter needs a warm spot to ferment. You want to see pea-size bubbles on top and also under the batter when you examine it. Making idli with batter that isn't properly fermented can lead to hard, dense idlis, which is very disappointing. - If it doesn't ferment properly, you can always make dosa or uttapam (simply by adding water to make a pancake batter) because they don't require as active fermentation as idli. 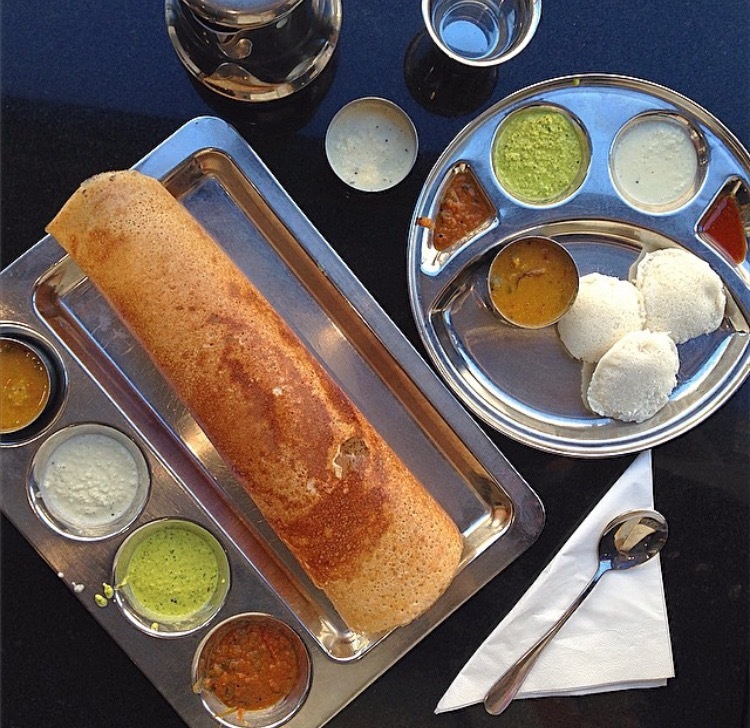 Dosa and idli are perfect with a side of coconut chutney and sambar. I love uttapam with coconut chutney for a filling breakfast. - Extra coconut chutney can be frozen for later use, up to 3 months or more! Steamed idlis can also be frozen.